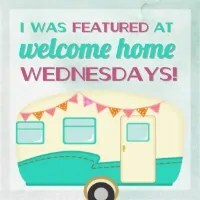 Welcome to Welcome Home Wednesdays number 98!!! Hope you’ll had a wonderful and safe 4th of July! It’s back to work, although it feels like we should have the day off! Thanks for being here! If you have a chance, please click thru and see what La Victoria has been helping cook up over the last 100 years! They celebrating the milestone with Mexican-inspired flavor like These Duck Tacos with Cherry Orange Salsa I recreated from Chef Gustavo Romano. Like any good hosts we’re sitting right by the present table waiting until our guests leave so we can go through the loot… the loot being your Welcome Home Wednesdays #98 links! We can’t wait to check out what you’ve left for us. Trust me there will be a lot of pinning, tweeting and facebook sharing going on in the near future… we can’t wait to show off what you’ve left! Thank you Erin for co-hosting the 98th Welcome Home Wednesday. Have a great week. Thanks for linking with us every week, Joy! Hope you week is going well! Thank you for hosting this holiday weekend! I hope you had a relaxing time. Thanks for partying with us, Marilyn! Hope you had a nice holiday!